Now that the NBA Draft Lottery is over, we know where each team will pick in the 2013 NBA Draft. I thought I’d take this opportunity (before Arturo does) to get in a quick post about the top ranked NCAA basketball players. Earlier this year we unveiled Wins Produced numbers for college basketball players. This model works for college just like it does for the NBA. Now, keep in mind that college performance does not predict NBA performance perfectly; this exercise simply shows how productive these players were in college last year. But players who are productive in college have a much better chance of being productive in the NBA. The numbers I’ve used below do not include games played in this year’s NCAA tournament. We will update this analysis in the future. Pay attention to our position assignment. This may not be the position the player will play in the NBA. And as these positions were assigned by an automated process (developed by Arturo Galletti), it also may not have been the position played in college. Position averages for ADJP40 are provided if you wish to calculate WP40 at different positions. With that in mind, CBS Sports posted a mock draft on May 21st [Editor’s note: CBS Sports has since updated their mock draft]. I decided to take the top 25 NCAA players from that mock draft and rank them by Wins Produced per 40 minutes (WP40). That means that this list does not necessarily include the top NCAA players in terms of wins or WP40; I’m simply re-ranking CBS Sports’ top 25 players by WP40. As you can see, these lists don’t agree perfectly. For example, Jeff Withey is ranked 5th among these players in terms of WP40, but only ranks 24th in CBS Sports’ mock draft. And Shabazz Muhammad is ranked 23rd in WP40, but 10th in the mock draft. But the player ranked #1 by CBS did post the best WP40 of these 25 players. UPDATE: Just a quick note (from DJ)… I would emphasize that I do not regard the WP40 ranking as a ranking of who will be the best NBA players. This is simply an analysis of what each player did last year in college. Again, there is a correlation between college and the NBA. But as anyone who has looked at the numbers understands, it is not perfect. 17 Responses to "A first look at the Top 25 NBA Draft prospects"
It would be nice to include an age column, as that is a factor in reconciling draft position with college productivity, especially for a guy like Withey. Unlike with points per game, most of this community would agree that youth is valuable in draft picks. There is a typo somewhere in Victor Oladipo’s row. Not sure if his ADJP40 or WP40 is wrong but those don’t add up. One of them appears to be off by .100. Love this, Devin. CBS hates Kelly Olynyk because he’s a goofy tall guy despite his production at Gonzaga. CBS loves Ben McLemore because he’s got monster hops despite his tendency to disappear in games. And why is everyone expecting Dieng to drop into the 20s? He put up some crazy games in the tournament, posted very solid stats all year, and yeah, he’s older, but man, he looked statistically fantastic. I wish you guys did something with the combine results as well. It would be a way to see who dominates in games and who are the best athletes. The guys who are both productive and athletic would seem to have the best chance at NBA stardom. I know you guys don’t care, but it would be cool. 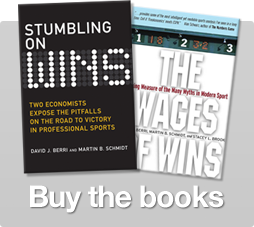 Wages of Wins is best in June. I see a lot of very good big men. But they are all tall and older. I am very curious how that will play out in the rankings. Kelly Olynyk numbers look amazing but are his numbers that much better than T Zeller’s? I like Larkin as an under rated buy. The rebounds and assists need improvement but the shot pattern looks perfect and the Assist to TO improvement is impressive. Interesting to see Olynyk, Dieng and Withey so high. I think all 3 are great prospects who have fallen on draft boards because they’re counted out for being older, without the question being asked if it matters. All 3 are athletic, intelligent and skilled. Nice combo. Where would Jack Cooley rate? I don’t think age should be a determining factor in the draft outside of maybe the top 5. Free agency, yes. But in the draft you can get out from under a player in 2 years. If they really are maxxed out on talent and don’t improve, you don’t have to take their two team options. We saw this happen with Terrence Williams and I believe Hassan Whiteside. Where teams do it wrong is when they become overly invested in their picks (sunk costs) and double down on players that aren’t panning out. I would take the guy I am almost certain will produce for 4 years, that I can let go anytime, over some guy who could be good or could be a career D-Leaguer. I exclude the top 5 because 2-5 you’re drafting potential no matter what, and #1 is almost always a no brainer. this college wins produced is going to be awesome next year. The non-draft prospects will have extra minutes—better sample size, better predictive ability. I’m not saying that every 19 year old is a better investment than every 23 year old, but where production is similar, that’s obviously a factor. I think the misunderstood factor of age is this. Take a 23 year old and get 4 or 5 years of him and you’ll get him close to his basketball prime ages at rookie contract levels. Great overproduction for pay opportunity. Now if you want to get the player with absolute best upside and potential superstar production in the future then the 19 year old is better, but you will pay 2-3 years of his bargain contract for him to learn and grow into his prime. If you are a decent team already and just need to plug holes, the older guys are perfect because they help you win sooner and keep your cap situation in order. If you are a bad team rebuilding then you want the 19 year olds. If it turns out right you end like the Thunder. If it turns out badly, you end up like the Kings and can just do it all over again. Interesting method. I was curious to know if your theory hold true against previous year drafts. Perhaps by looking back, your conclusion is more solid, especially with analysis on how the perform in NBA. For example, Michael Beasley ranked 2nd on the draft, every analyst also think he should be number 2 or even top pick. But, he didnt fare well in the NBA. Perhaps your method already show it then. For the guy wondering if teams woud trade an Oladipo pick for Harrison Barnes.. 100% would I think. Barnes is younger and has shown that he translates to the league on some level.